As our regulars know, Camilo began his career on Wall Street in New York City at J.P. Morgan, one of the premier investment banking franchises in the world. Growing up poor in Minnesota, it was the last place I ever expected to be working. I saw my dad work hourly jobs at places like Burger King and Dunkin Donuts, so I thought that might be more fitting. But getting into and graduating from an Ivy League university changed my life forever. I learned a lot of lessons from that experience of going from poverty to the ivy league. But my learning didn’t end in college. As a fresh-eyed college graduate entering the world of investment banking, I knew I would be spending a lot of time at the office working hard on projects for our clients (the world’s largest companies). With a freshly minted bachelor’s degree in finance from Wharton and two summer internships at J.P. Morgan, I was excited to do the work I was hired for. And I was ecstatic to be making a base salary of $70,000 plus a hefty annual bonus in only my first year of working. I knew this money would mean that I would never have to live in poverty again. However, what I wasn’t ready for were the regular calls from friends and family asking for personal finance advice. They wanted to know if they should refinance their student loans, how to make a budget and what a 401K was. What they didn’t realize is that my job as an investment banking analyst really had NOTHING to do with managing my personal money at all. They assumed that because I worked in corporate finance that surely, I must be a personal finance expert. In fact, It was this very experience that helped solidify my passion and interest in personal finance. After that, I consumed the best personal finance books I could find. 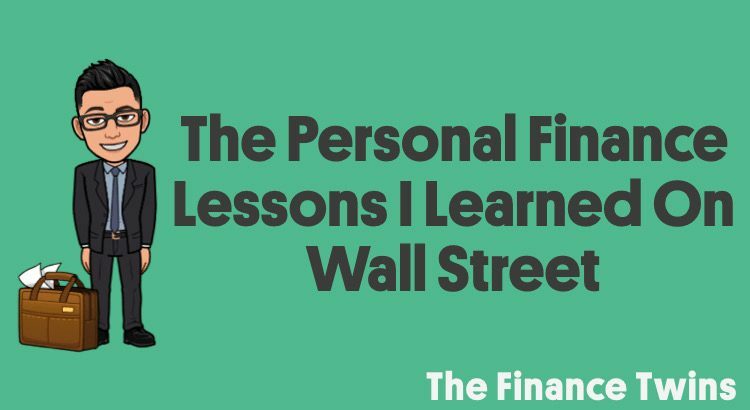 Today, I’ll be sharing the personal finance lessons I learned from working on Wall Street. Upon graduation I joined J.P. Morgan’s investment banking division. The group I worked in advised some of the largest companies in the world. Traditionally, the sexiest part of investment banking is the M&A (mergers and acquisitions) work. This jargon simply means that we’d help our clients buy other companies, or help them sell their company to an interested buyer. As the most junior person on the team, it was my job to crunch the numbers for these transactions. One of the biggest lessons I learned on Wall Street is that the amount of work to accurately value a company’s fair share price is astounding. We had access to the best tools and research in the world, yet we would regularly be at the office working until 2am or 3am every night. There were a couple of weeks where I clocked in over 130 hours. That’s almost 19 hours a day for 7 straight days. 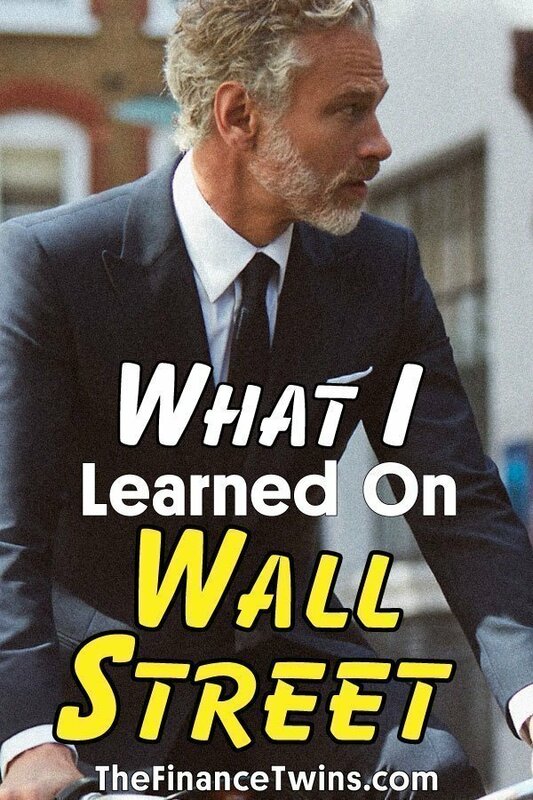 But it was an extremely valuable lesson, because now I know that buying individual stocks is a bad idea. I quickly learned that a lot of the stock price valuation skills I learned and practiced daily didn’t really matter for my own investments since picking individual stocks is a bad idea. There are a couple of reasons for this. First, the fees that you’ll incur actively buying and selling stocks will mean that you’ll have to beat the market by a couple of points to even make it worth doing. Beating the market consistently is something that professional investors can’t do. It’s true, very, very few investors can consistently beat the market average over a long time horizon. In fact, the majority of hedge funds (professional trading companies with some of brightest minds in the world) are unable to beat the market year after year. You can think of a hedge fund as a company in Manhattan where a bunch of Harvard and Yale grads wear Patagonia vests and do research on stocks around the clock in the hopes of beating the market average, while being hopped up on caffeine and the promise of incredible bonuses if they succeed. Even Warren Buffett, who is regarded as the world’s most shrewd investor, still recommends investing in index funds. The good news is that it’s pretty easy to pick which low cost index funds to invest in. After valuing countless companies I started to see that the companies with the highest profits were the ones that kept their costs the lowest. In other words, they made more money than they spent, and lived well below their means. This became a core part of my personal finance philosophy and it is your first line of defense when it comes to personal finance and building true sustainable wealth. If you don’t track something, you’re never going to change it. The last lesson I learned is that making a lot of money, or knowing how to manage money isn’t enough. In fact, I saw plenty of my colleagues across Wall Street buying weekend homes or cars that they couldn’t afford. Sure they had the money, but they were going into debt or under-saving for retirement to fund their lifestyles. They got trapped by the lifestyle creep, which is the silent money thief that so many people inadvertently let into their house. Many of my colleagues were “rich” but not wealthy. They traveled the world, wore fancy suits, and lived in the nicest apartments in the city. But they weren’t maximizing their 401K contributions. It didn’t make any sense. Living within your means takes a lot of discipline and hard work. Delaying gratification goes against our natural tendencies at first. It just also happens to be that the things that bring you the most happiness are the shared experiences you have with your loved ones. In a world where we are pushed to spend like crazy, the best things often come without a price tag. Focus on that. You got this. Hi guys, I have something to share here and i want you to make use of this opportunity. I had a total of $22,000 in student loan and credit card debt that I couldn’t pay for 3 years until I made a budget and cleared all my debts. It helped raise my credit score to 800+. I’m so happy right now and preparing to buy my first house. Thank you! For me, it all started with a budget. Hadn’t realized how important they are. Now I know. Same for me too! And the knowledge that I could work hard to make more money than I ever thought possible. Thank you both for sharing! Couldn’t agree more! Thank you! Very nice article!